Bilderberg.org :: View topic - Someone is copying posts onto annother site! Someone is copying posts onto annother site! Posted: Tue Jul 07, 2009 7:38 pm Post subject: Someone is copying posts onto annother site! The cornuto has to be made with the left hand only. If he's using the right hand then he's maybe making the sign of the university of Texas? Well, now you don't know what you're talking about. The people on this photograph belong to the Church of Satan, which is an atheist religion. They don't worship Satan as a real being. On this photograph they are practicing for their appearance in a movie. 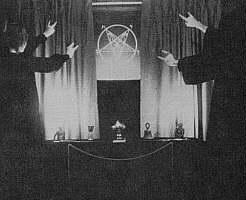 Real satanists worship Satan as a real deity. I'm not inventing stories. I'll show you wrong. Made using a combination of the letters 'I', 'L', and 'Y' from American Sign Language. It is made by extending the thumb, index finger, and little finger while the middle and ring finger touch the palm." Why does everyone do it wrong? I have no idea. Why does everyone attach the Belgian flag to the pole with the wrong color? They attach the black field to the pole, but according to the description of the Belgian flag in the law, the red field has to be attached to the pole. Why does everyone do it wrong? No one knows. Everyone pronounces the name of God in the wrong way. Everyone does it wrong and that doesn't make it right. Why does everyone do it wrong? No one knows. First of all the I love you handsign is sign language for the deaf and VERY recently invented. Your photographs are also very recent. Who cares if they are doing it "wrong" because some book published by who knows sais it's wrong. They are still doing it.....the rules of a book probably published by a christian mean nothing. We could ask them where they found this idea. They must have had a good reason to write that. What kind of logic are you using? You said that the ILY sign is a recent invention because you wanted to suggest that the signs on the photographs are older so they must signify something else than "I love you". So I said that the photographs are also recent, so they may be more recent than the invention of the ILY sign, which means that the sign on the photographs might be the ILY sign.